Writer, director John Landis is best known for his comedy work in the 80s, particularly the Blues Brothers, Trading Places, and Three Amigos. 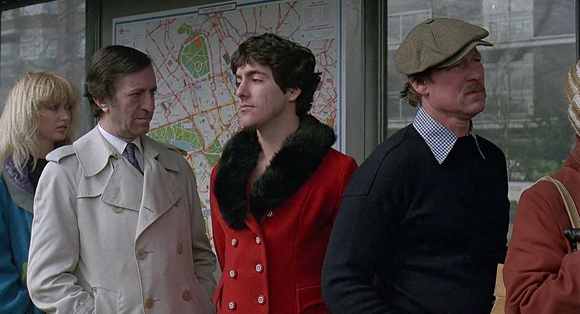 But the cult classic, An American Werewolf in London was one of two forays he made into the horror genre (I never saw Innocent Blood, but reviews were pretty bad). Admittedly I’m not a huge horror film fan, but what I loved about American Werewolf was the dry sense of humor that Landis brought to this pretty gory film. There are a number of subtle things – like a cut away to a little wide-eyed, arms outstretched Mickey Mouse figurine almost looking to hug David as he graphically and wrenchingly transforms into a werewolf. And after having spent the evening slaughtering half a dozen people, there’s classic Shakespearian comic relief the next morning as David wakes naked and confused in a zoo cage with wolves. He spends the next ten minutes streaking London, until he steals a lovely women’s coat which he wears on a bus ride home. So the original poster blends the droll and the savage sides of the movie quite well, I just gave each of them a little animated accent. To create the vibrating werewolf head I used two frames from the scene of David’s metamorphosis and replaced them on the poster in Photoshop. The nod to the British lady that catches David covering himself was created by using the puppet warp tool on a selection of him. And in order to have the nod be brief with a long pause between, while the werewolf head kept moving a lot of duplicated frames are needed in the animation (42 in total). I wish I knew how to do this with the fewer frames and keep the file size down, as there are only five unique frames needed to make the animation. I dig this idea of animating movie posters, its another approach at working to identify and accentuate critical elements of films. And doing two elements is double fun! How are you creating the GIFs? I’m doing mine in PhotoShop where layers are used to create the key frames in the Animation window. I use the sliders to set the timing for each frame, which means you dont have to use repeated frames to control the timing. That’s why her hair is so big, it’s full of secrets. | Time you enjoy wasting is never wasted.